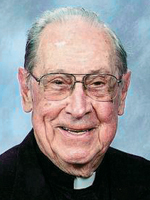 Father Henry C. Graf, 92, pastor emeritus of St. Isidore Parish in Quakertown, died May 14. Born in Philadelphia the son of the late Henry C. and Mary (Schreck) Graf, he attended St. Ludwig School and St. Joseph’s Preparatory School before entering St. Charles Borromeo Seminary. He was ordained on May 26, 1949 by Bishop Hugh L. Lamb at the Cathedral of SS. Peter and Paul and his initial assignment was as parochial vicar at St. Elizabeth Parish, Glen Argyl. This was followed by assignments as parochial vicar at St. John Baptist De La Salle, Shillington; St. Thomas the Apostle, Chester Heights; Sacred Heart of Jesus, Allentown; St. Raymond of Penafort, Philadelphia; St. Katherine of Siena, Philadelphia; St. John the Evangelist, Philadelphia and St. Dominic, Philadelphia. Judy Barton well remembers Father Graf from his days at St. Dominic. Her dad was a scoutmaster and he and Father Graf were good friends. “He was a wonderful guy, open to everyone and very friendly with the whole people,” she said. Father Graf was appointed pastor of St. Isidore in 1978 and continued there for almost 20 years. Deacon Patrick O’Donnell has only been a permanent deacon assigned to St. Isidore for the past three years, but in Father Graf’s day both he and his wife were very active parishioners, and it was Father Graf who first suggested he enter the deacon program. Although Father Graf officially retired in 1998, while living at Regina Coeli Residence, a home for retired archdiocesan priests, he continued to help with ministry first at St. Lawrence in Riegelsville and later when the drive became too much for him, at nearby Nativity of Our Lord Parish in Warminster. “He was very pleasant and helpful to me and generous with his time and talent,” said Msgr. James Beisel, a former administrator at Regina Coeli. His great hobby was golf in a foursome with priest friends of long-standing of whom he was the last survivor, according to Msgr. Beisel. A viewing for Father Graf will be held on Monday, May 25 from 5 to 9 p.m. at St. Isidore Church. There will also be a viewing on Tuesday, 9 a.m. at Nativity of Our Lord Church followed by his 11 a.m. funeral Mass celebrated by Archbishop Charles Chaput. Concelebrants will include Msgr. William J.J. O’Donnell, Fathers Angelo Citino and Francis J. Cornely and Msgr. Beisel, who will be the homilist. A memorial Mass for Father Graf will be celebrated at St. Isidore Church on Sunday, May 31 at 9 a.m.
Father Graf is survived by cousins.